The bedroom features another incredible sight: the original 13th Century roof wooden beams and tiles have been perfectly preserved through the centuries and constitute today's ceiling' finishing! 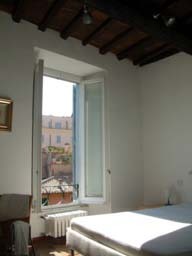 On the less historical side, the bedroom is thoroughly modern in terms of convenience! Specifically, there is a lovely and very comfortable king-sized bed, a very large built-in closet, a writing desk and access to the ensuite bathroom.